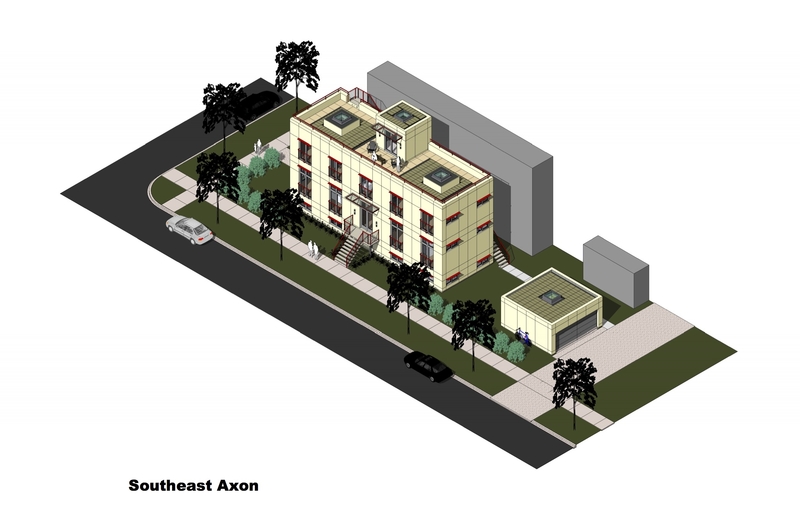 The program called for the hybrid design of a single-family home combining classical principals and a modern aesthetic in an energy efficient enclosure in the city of Chicago. Additionally required were 3 bedrooms, a music room with it’s own entry, a craft studio, a rooftop garden, a living/family room, dining room, kitchen, bathrooms, and various seating nooks. The fenestration, rain screen panel modulation, massing proportions, and organizational layout of the home were inspired by French classicism. The buildings structure was expressed openly with the exposed CMU walls, open web steel trusses with floating ceiling planes, and polished concrete floor. The exterior enclosure utilizes sustainable materials and systems with a reinforced CMU wall, continuous R15 outsulation (R49 on the roof, and R10 under slab), an applied liquid membrane, and a panelized rain screen system. The roof garden employs LiveRoof Hybrid green roof vegetation to maximize storm water management. The home is conditioned by a 7-day programmable in-floor hot water radiant boiler system and high velocity cooling system.